GransforsBruk is an exclusive axe museum in Sweden. The museum has been successful in accommodating several pre-historic axes. They even allow their visitors to try and throw the axes in order to find out the difference in their builds. Also available for purchase, this might be more of a better place for axe- enthusiasts. However, people are who do not associate themselves with axes or any kind of tools will also find interest in learning about the reasons and ages in which the axes were crafted. Try the best BergsjÃÃÃ‚ƒÂ¶ trip planner to visit this Gransfors Bruks as well as many others. Hotels like BergsjÃÃÃ‚ƒÂ¶ Hotell, 17 Rum Och KÃÃÃ‚ƒÂ¶k and BerggÃÃÃ‚ƒÂ¥rdens GÃÃÃ‚ƒÂ¤stgiveri will solve your problem of where to stay in BergsjÃÃÃ‚ƒÂ¶. Curated BergsjÃÃÃ‚ƒÂ¶ vacation packages await! Book the best ones and start turning your dream into reality.Discover various ways for how to reach BergsjÃÃÃ‚ƒÂ¶ and complete the booking by choosing your mode of transport. 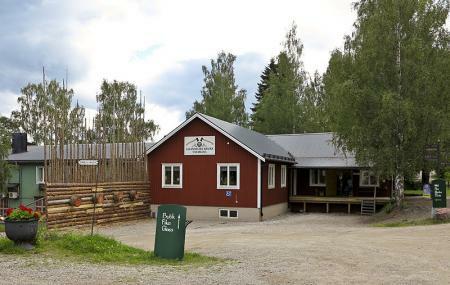 The axe museum at Gränsfors Bruk is well worth the visit. There is a museum housing axes throughout the years together with the production facility which is free to look around. At the factory you can see steel being smelted and forged into axe heads before they are treated and sharpened ready to have the handle attached. You are free to roam around the factory and staff are more than happy to answer any questions. There is also a great gift shop where you can purchase your very own Gränsfors axe, just don’t leave it in your hand luggage..! Great place, very interesting to see how my great axes are made. Cosy place to stroll around and enjoy a piece of Swedish industrial history. I love this place. It's so genuine! Don't miss the production or the shop.